DCM offers a rebuild service for your gauges as well as already rebuilt gauges. We also sell the lens and other parts to help you restore a functioning gauge. Give us a call and see if we have what you are looking for. 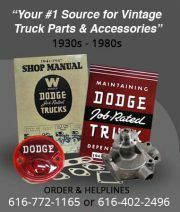 This entry was posted in DCM Classics, Product, Used Products For Sale and tagged @dcmclassics, auto parts, DCM, DCM Classics, Dodge, Dodge Truck, Gauges, parts, vintage auto parts. Bookmark the permalink. Yes we do – everything from glass to seals. Visit the website or give us a call.